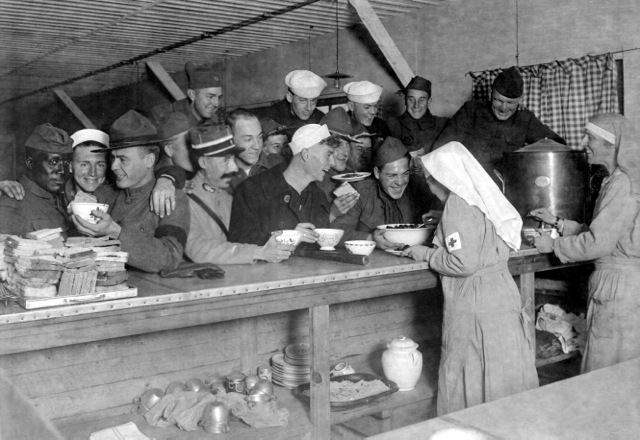 Did the U.S. Have Food Rationing in World War I? During World War I, a voluntary policy of food conservation was devised by the United States Food Administration, headed by Herbert Hoover. Food was necessary not only to feed America’s growing army, but to help relieve famine in Europe, in part to prevent the overthrow of European governments and the spread of communism. Hoover wrote: “Of course, the prime objective of the United States in undertaking the fight against famine in Europe is to save the lives of starving people. 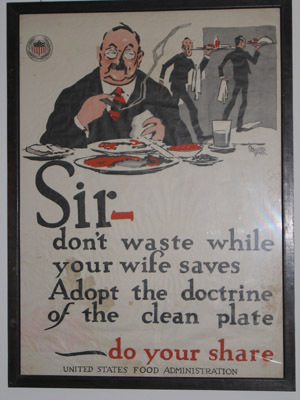 “Food Will Win the War” was Hoover’s slogan. This was the moment when Hoover became a household name in America: To “Hooverize” entered the vocabulary as a synonym for economize. Rationing of foods such as sugar, meat, and flour were suggested, not mandated. "Meatless Mondays" and "Wheatless Wednesdays" were recommended. Americans were also encouraged to grow their own food and eat less to ensure a steady food supply. A great brow, almost graceful in design, an expression at once profound and child-like, a dimpled chin, a proud mustache, a bitter gaiety about the mouth I shall recollect you, face of France, even though it is only for the single second that I saw you, in the flare of a match. The train that went from Chalons to Sainte Menehould, that autumn night, was on the way up again, with all lights extinguished. It was in 1916. The face of Champagne, calm just then, was sleeping at our left, the sleep of the craters, a sleep full of nightmares, sudden starts, and flashes of lightning. We cut through the darkness, making our way slowly through a wretched country which we could see was disfigured with the hideous raiment of war. The little train hobbled along,panting, slightly hesitant, like a blind man that knows his way. I was coming back from a furlough. I was feeling ill and had stretched myself out on a bench. In front of me three officers were talking. Their voices were those of young men; their military experience was that of veterans. 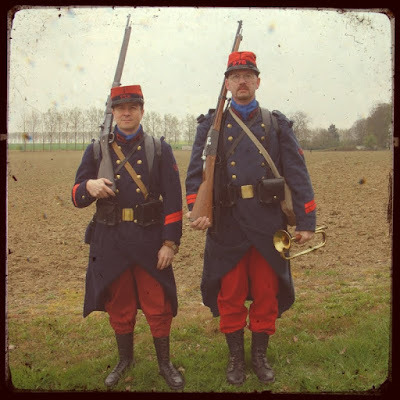 They were on their way to rejoin their regiment. "That sector,"said one of them, "is calm just now." "That's certain," said another. "We shan't have any trouble there until spring." "Oh! They'll be sure to get us into some sort of tomfoolery before spring." "This will be the twelfth time that I've gone into action. But I'm always in luck: I have never been wounded but once." These two phrases have remained in my ears ever since, because the man who uttered them struck a match and began to smoke. The flare gave me a fleeting glimpse of a charming face. The man belonged to a famous corps. The insignia of the highest honors that can be granted to young officers glittered on his light-brown jacket. His whole presence radiated a sane and tranquil courage. The night again took possession of the compartment. But will there ever be a night black enough to rob me of the image glimpsed in that flash of light? Will there ever be a silence heavy enough to stifle the echo of those two little phrases murmured amid the humming of the train? I have often thought of them since, whenever, as on this evening, filled with anguish and love, I have turned my mind, now to the past, now to the future of these Frenchmen, my brothers, who in such great numbers have accepted death without forgoing the expression of what their hearts contain, those Frenchmen of whose grandeur of soul, indomitable intelligence, and touching naiveté the world knows too little. Could I help thinking of this now, at the consummation of the martyrdom of a wonderful people which in the midst of a night that has no shore seeks for nothing but the boon of order and self-preservation? In this prewar photo that perfectly captures the Kaiser's militaristic enthusiasms, he is inspecting a Guards detachment, probably at Potsdam. As Wilhelm marches past, each of the soldier's heads snaps forward from the "eyes-right" position. Like their British equivalents, the "Old Contemptibles," most of these men were probably killed or wounded in the coming war. [The Kaiser] is like a battleship with steam up and screws going, but with no rudder, and he will run into something some day and cause a catastrophe. He has the strongest army in the world and the Germans don't like being laughed at and are looking for somebody on whom to vent their temper and use their strength...Now it is 38 years since Germany had her last war, and she is very strong and very restless, like a person whose boots are too small for him. I don't think there will be war at present, but it will be difficult to keep the peace of Europe for another five years. Not only all the kings I had met, but the two or three I had not previously met, were more than courteous, and the Kaiser made a point of showing his intimacy with me and of discriminating in my favor over all his fellow sovereigns. The only man among the royalties who obviously did not like me was the Archduke Ferdinand, who is an ultra-montane, and at bottom a furious reactionary in every way, political and ecclesiastical both. Later at a reception for the kings and various ambassadors he encountered Wilhelm at his rudest. Afterward, Roosevelt continued on to Berlin as part of the lecture series he had begun when Edward VII had died. The Kaiser not only attended his lecture but invited the president to attend military maneuvers. 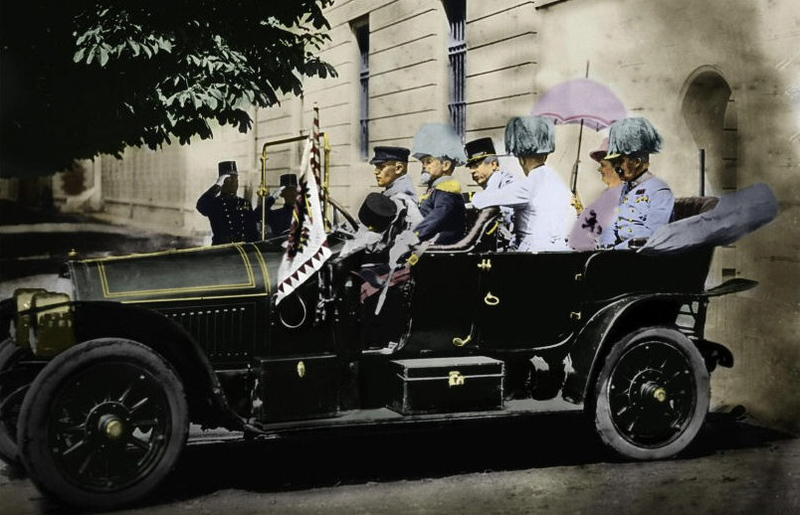 Roosevelt was greatly impressed by the Kaiser's zest for things military. 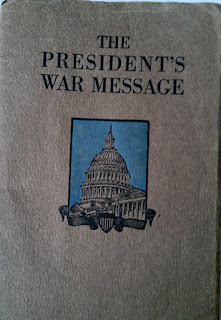 He later explained why he had strongly encouraged America's preparedness effort after war broke out in 1914. 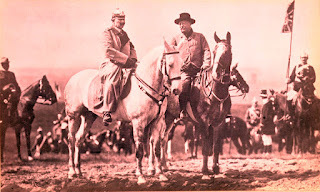 At the invitation of Kaiser Wilhelm, I attended the spring maneuvers of the German Army. If you had heard and seen what I saw you would feel just as I do. 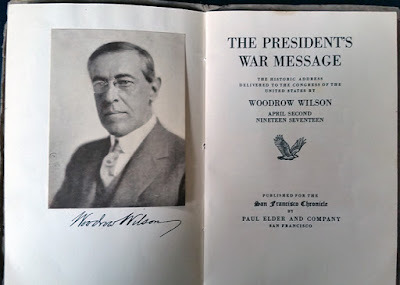 Some notes from a line-by-line reading of President Wilson's speech of 2 April 1917. The full message can be found here. a. The present German submarine warfare against commerce is a warfare against mankind. b. For a universal dominion of right by such a concert of free peoples as shall bring peace and safety to all nations and make the world itself at last free. . Our motive will not be revenge or the victorious assertion of the physical might of the nation, but only the vindication of right, of human right, of which we are only a single champion. . . Our object now, as then, is to vindicate the principles of peace and justice in the life of the world as against selfish and autocratic power and to set up amongst the really free and self-governed peoples of the world such a concert of purpose and of action as will henceforth insure the observance of those principles. Note: I don't about you readers, but to the editor this second abstract (foggier) argument detracts from the first concrete point. It's also interesting that the second line of reasoning permeates the entire speech, while the specifics of Germany's infractions are much briefer. Note: A century later, this sounds like Wilson already had his heart set on his solution to all the world's troubles. One of the things that has served to convince us that the Prussian autocracy was not and could never be our friend is that from the very outset of the present war it has filled our unsuspecting communities and even our offices of government with spies and set criminal intrigues everywhere afoot against our national unity of counsel, our peace within and without, our industries and our commerce. . . But they have played their part in serving to convince us at last that that Government entertains no real friendship for us and means to act against our peace and security at its convenience. That it means to stir up enemies against us at our very doors the intercepted note to the German Minister at Mexico City is eloquent evidence. Note: I was surprised by this mention. I didn't think the Germans would be foolish enough to sink a hospital ship while the U.S. was considering entering the war. However, HMHS Gloucester was sunk on 30 March 1917 by U-32. It will involve the immediate full equipment of the navy in all respects but particularly in supplying it with the best means of dealing with the enemy’s submarines. It will involve the immediate addition to the armed forces of the United States already provided for by law in case of war at least five hundred thousand men, who should, in my opinion, be chosen upon the principle of universal liability to service, and also the authorization of subsequent additional increments of equal force so soon as they may be needed and can be handled in training. 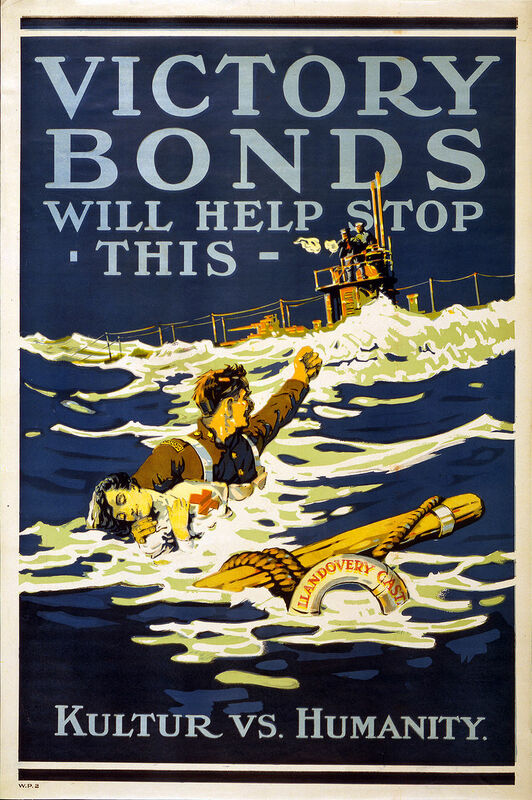 Note: Eventually 4.7 million men served in the armed forces in WWI. 7. Russia Was Always Democratic??? Russia was known by those who knew it best to have been always in fact democratic at heart, in all the vital habits of her thought, in all the intimate relationships of her people that spoke their natural instinct, their habitual attitude towards life. Note: The United States Senate, in a 74 to 0 vote, declared war on Austria-Hungary on 7 December 1917, citing Austria-Hungary's severing of diplomatic relations with the United States, its use of unrestricted submarine warfare and its alliance with Germany. 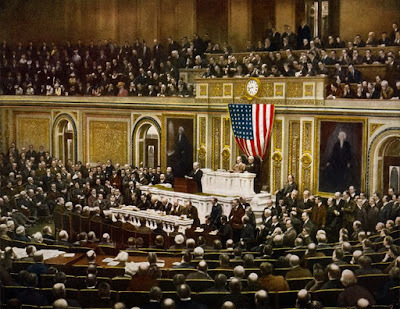 The declaration passed in the United States House of Representatives by a vote of 365 to 1. If there should be disloyalty, it will be dealt with a firm hand of stern repression; but, if it lifts its head at all, it will lift it only here and there and without countenance except from a lawless and malignant few. God helping her [America], she can do no other. The authors Coetzee have given Great War historians another spell-binding work (previous World War I: A History in Documents and Empires, Soldiers, and Citizens: A World War I Sourcebook). However, the words of the authors do not do the stunning. Instead, it is the words of Great War participants, faithfully reproduced from their diaries, that stun the reader with their often on-the-brink -of-disaster descriptions or calm, measured words that assure the reader that everything is as it should be in time of war. That does not mean the authors are completely mute about the day-in and day-out entries. Their introductions to each of the diarists make the reader totally familiar with the chroniclers through a brief biography going from birth to the writers' ends. These introductions make the otherwise unknown diarist into an old friend who is about to take the readers into his confidence. There are five previously unpublished works and one reprint in the pages of this book. The diarists inhabit levels of participation that many of us are unfamiliar with and, therefore, the analogues are fresh, informative, and of great interest. 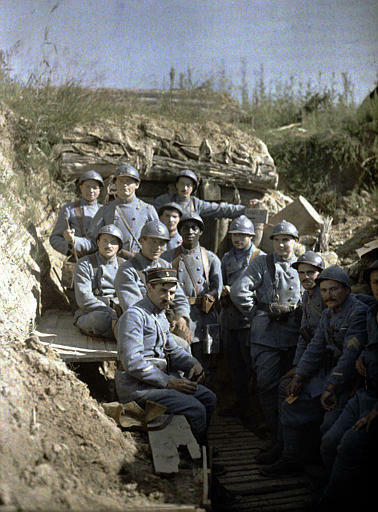 There are the usual fighting men: a British sapper who digs the mine tunnels along the Western Front, an American ambulance driver in the early years of the war, an ANZAC artillery man at Gallipoli, and a French infantry officer embroiled in some of the most noteworthy battles. Outside of the military presence, there is an interned German businessman and a German prisoner of war in the French system. Notable in all the diaries, with the exception of the French officer, is a lack of hatred for the enemy, a lament over dreaded living conditions, or despair for the way the war is going. What the reader finds is a candid, day-by-day account of what is transpiring in the writers' lives. Sometimes, the entries are repetitive, but that is as it should be. Then there are other entries which are highly informative. The German businessman very adequately describes the British internment procedure and the German prisoner of war minutely outlines the treatment of the captured soldier from the first moment to the last—nearly a year after the war was over. But even putting aside the last day-of-my-life existence that the French officer constantly enters, his diary gives readers a look at what the man in the trenches thought of the overall conduct of his superiors who inspect men in the trenches while noting that shoelaces are unkempt and buttons not well cleaned. This work opens levels of Great War participation that have not been adequately explored. Previously printed diaries seem to pale in light of these entries that neither lament nor glorify the war as so many of those others have. It was very refreshing to find people saying that the war is bad but one has to adapt and move on. It dethrones otherwise lionized levels of Great War participation. Even the morose French officer's sarcasm toward his superiors is tempered by respect and a deep knowledge that winning the war has to be pursued regardless of the losses. This is a must read for historians. 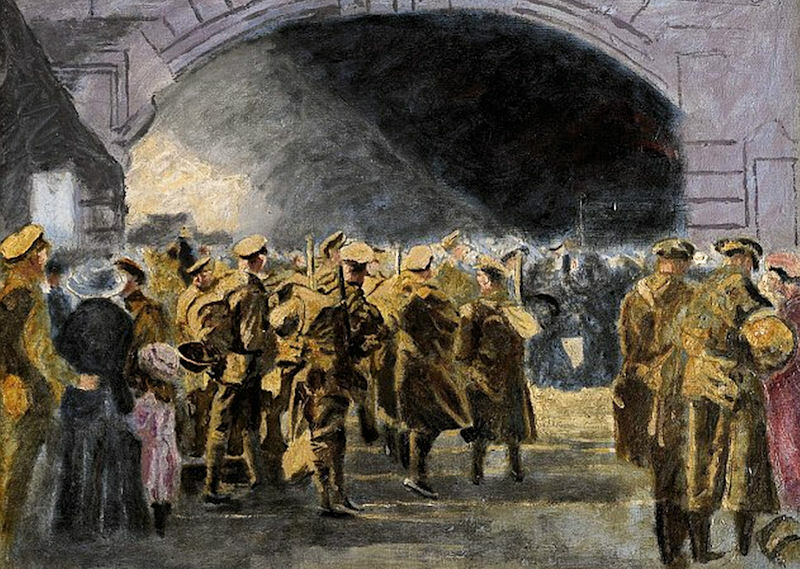 This rare painting by Sir Winston Churchill, titled "Troops Going to the Front,", sold at auction for £461,000 ($711,400) at Sotheby's London in June. Churchill painted "Troops Going to the Front'" in 1927, inspired by a photograph taken by F.J. Mortimer ten years earlier. The canvas shows soldiers waving farewell to their loved ones at Victoria Station in London as they leave to join the war. Churchill himself served on the Western Front in 1916. One of the most famous assaults of the Gallipoli campaign, the Battle of Lone Pine (6–9 August 1915) was intended as a diversion from attempts by Allied forces to force a breakout from Suvla Bay and the Anzac perimeter on the heights of Chanuk Bair and Hill 971. It was in this log-covered trench complex, in total confusion, amid screams of anguish and despair, Lone Pine became a furious nightmare of hand-to-hand combat. "We were like a mob of ferrets in a rabbit warren," one trooper said. "It was one long grave, only some of us were still alive in it." It was a "success" at the price of 2,200 Australians killed or wounded and about 7,000 Turks killed or wounded. In one charge it was so hot that we had no time to remove the wounded and, horrible to tell you, We had to tread on these poor dead and dying men lying in the trench to keep the gaps in the line filled. All war is horrible but this trench warfare is awful. A large proportion of wounds were in the head. I cannot wear my tunic today because it is all soiled and stained with a poor boy’s brains which were splashed all over it I saw the whole side of this lad’s skull simply ripped out and his brains splashed round. . . When we left yesterday the trenches were indescribable. You must remember that not only our dead but the dead of the two previous days’ fighting, Turks and Australians often locked in a last death struggle, still lay there in large numbers in spite of all efforts. Many had had in fact been removed but they were so many in all that no real impression had been made. Moreover their poor corpses were continually smashed by the enemy’s shells and torn with bullet wounds. I leave the rest to your imagination. Such a lot of people write to me asking about their boys. I try to tell them all I am allowed to, but I am afraid I will be able to tell little of the fight. It was all like a horrible nightmare. Fancy seeing a man you knew blinded and with hands blown off trying to get up on his feet. . . . I must end now dear, I fear I am wandering a bit but I think you will excuse me. The Brigadier came down and congratulated us and said we have added to the reputation and our glory which will last for ever etc etc. but you could have my share of all the glory of the Battle of “Lonesome Pine” (as the hill is called from the one straggly old pine that once grew on its rugged top but which our Artillery has long since torn to ribbons and splinters) for one of the poor boys who died or was mangled to death there. Goodbye my dearie, goodbye. Pray that war may never come to Australia. Harold "Pompey" Elliott was a senior Anzac officer, businessman, and politician. At the August Battle for Lone Pine he commanded the 7th Battalion, AIF. 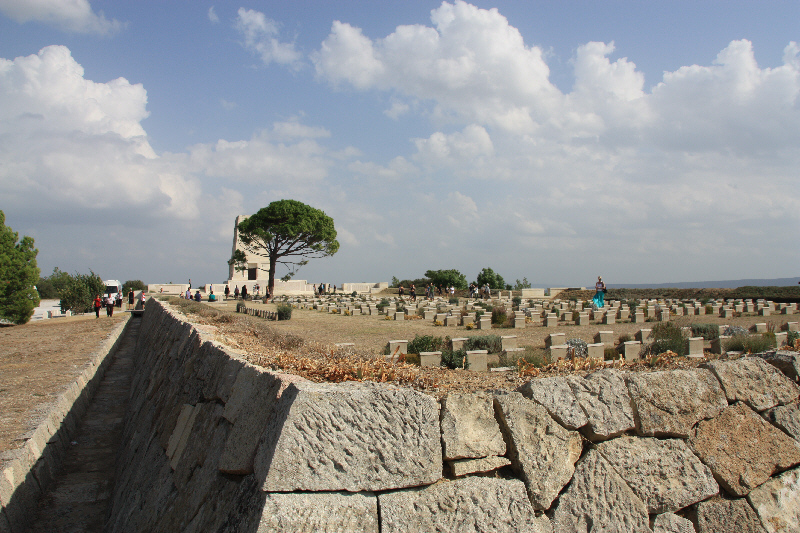 Four of the seven Victoria Crosses awarded at Lone Pine went to Elliott's battalion. He later commanded 15th Battalion at the disastrous Battle of Fromelles. Though the losses were not considered his fault, they limited his promotions, embittered him, and probably contributed to his suicide in 1931. Austria-Hungary is not well known for its fighter pilots. The largely rural, agrarian economy was not sufficient to meet the demands of a modern, mechanized war. The Allied blockade was especially severe in Austria-Hungary and shortages were everywhere, especially of rolled steel and coal. Her industries were only able to produce 5,000 aircraft and 4,000 engines during the entire course of the war. Italy, by comparison, even with a year less fighting, was able to produce 20,000 aircraft and 38,000 engines. Austria had generally only 500 planes in operation, spread out over the Russian, Balkan, and Italian fronts in both the Austrian Army Air Force and the naval forces. It's amazing that Austria-Hungary was able to field a Luftfaehrt-truppen, (LFT), Army Air Force, at all. But the boys did remarkably well. The top Austro-Hungarian ace, Godwin Brumowski, is credited with 35 official "kills" and eight more "unofficial” because the aircraft went down behind Allied lines. Brumowski was born in Wadowice, Austrian Galicia, 26 July 1889, the same year as Crown Prince Rudolf's supposed suicide at Mayerling. (Karol Wojtyla, the future Pope John Paul II, would also be born in Wadowice, in 1920.) 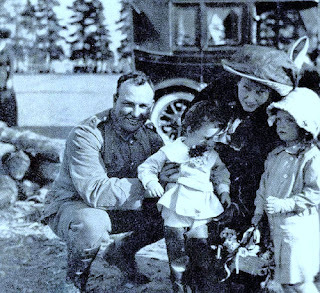 Brumowski was born into a military family. He later attended the Technical Military Academy in Moedling, near Vienna, graduating 10 August 1910. Upon graduation he was commissioned a Leutnant (second lieutenant) in the KuK Armee, field artillery, regiment #29. By the outbreak of the war, Brumowski had been promoted to Oberleutnant (first lieutenant), as regimental adjutant with the 6th Artillery Division, serving on the Russian Front until July, 1915. In July 1915, he transferred to the newly formed LFT Fliegerkompagnie I (FLIK I), stationed at Czernowitz. FLIK I was commanded by Hauptmann (captain) Otto Jinda. Brumowski was assigned to be a flight observer on the Russian Front. On 12 April 1916 Brumowski and Jinda participated in an audacious bombing raid on the Russian city of Chotin. Tsar Nicholas II and General Brusilov were there for a military review. 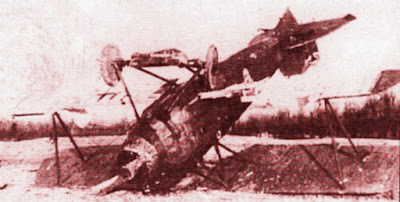 Jinda and Brumowski in their Knoller-Albatros bomber were able to shoot down two of the seven Russian Morane-Saulnier Parasols sent after the seven Austrian bombers. These were Brumowski's first two kills. Brumowski received pilot's training in late spring and early summer 1916 at FLIK I. On 3 July he was given the title of Feldpilot (field pilot). Five days later, after completing the requisite number of combat missions, he received his pilot's badge. In late April 1915 Italy entered the war on the side of the Allied Powers against Austria-Hungary, her former partner in the triple alliance. Brumowski was transferred to FLIK XII on the Italian (Isonzo) Front in November 1916. FLIK XII was under the command of Hauptmann Ápad Gruber. On 3 December 1916 Brumowski achieved his fourth kill when, along with Linienschiffsleutnant (naval lieutenant commander) Gottfried Banfield of the Trieste Naval Air Station and Zugsfuehrer (sergeant) Carl Cislaghi of FLIK XXVIII, he shot down an Italian Caproni bomber near the town of Mavinje. On 2 January 1917 Brumowski got his fifth kill, thereby becoming an ace when he downed an Italian Farman two-seater in the vicinity of Lake Doberdo. Brumowski and his observer, Oberleutnant Julius Goerffy von Telekes, were flying Hansa-Brandenburg C 168.24. February 1917 saw the establishment of FLIK 41J, the first purely fighter squadron of the LFT. Brumowski was offered command of the new squadron. First he asked for a posting to the German Jasta 24, located on the Western Front. He wanted to observe firsthand German unit organization and fighter tactics. While there, 19–27 March 1917, Brumowski flew four combat missions and made the acquaintance of Manfred von Richthofen, who impressed him with the red paint scheme of his aircraft. Brumowski assumed command of FLIK 41J in April 1917. During his tenure some of the best fighter pilots of the LFT passed through its ranks, including Kurt Gruber, Josef Novak, Karl Kaszala, and Julius Arigi. FLIK 41J was the finest fighter squadron in the whole LFT. Brumowski scored a number of "kills" during May and June, but during the 19 days of 10–28 August he achieved a series of 18 victories. Most of these occurred during the increased air activity accompanying the Eleventh Battle of the Isonzo (18 August–15 September 1917). On 19 August he got his fifteenth kill, achieving triple ace status by shooting down, in flames, an Italian two-seater Caudron. This was his first victory in an Albatros fighter. On 23 August Brumowski combined with a plane flown by Oberleutnant Frank Linke-Crawford and Korporal Heinrich Mayrbaeurl forced down an Italian Savoia-Pomilio two-seater from the Forty-fifth Italian Reconnaissance Squadron. This was his twentieth kill. Kill number 22 was on 9 October 1917 against an Italian observation balloon moored near the Isola Morosina. The balloon collapsed and burst into flames, but the crewmen were able to save themselves by jumping out with parachutes. 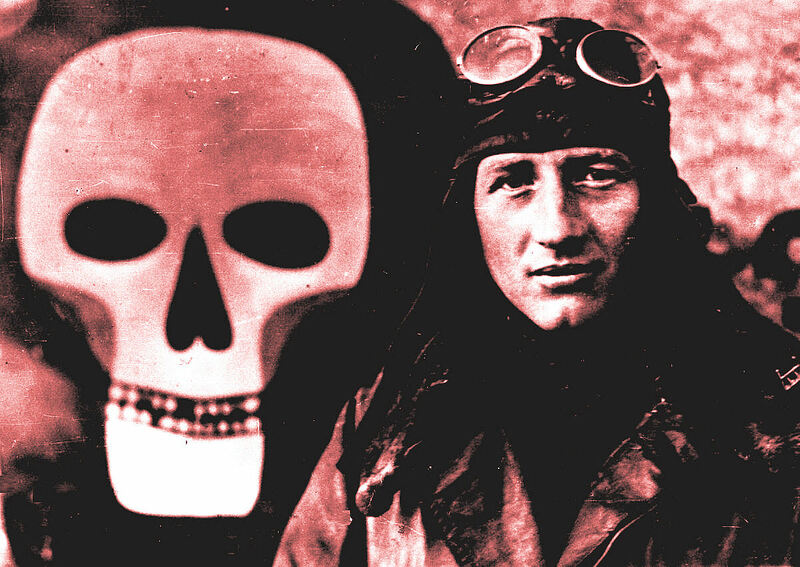 This was the first time Brumowski used his Albatros D.III (Oef) 153.45, which he had had painted scarlet overall with black shrouded skulls on both sides of the fuselage and on the top decking behind the cockpit in imitation of the Red Baron's color scheme. It was the first of several planes he would have painted in that design. A double kill occurred 23 November 1917 when Brumowski and Linke-Crawford combined again to down two Italian Nieuport fighters near the village of Cortelazzo at the mouth of the Piave River. After a relatively quiet winter 1917/18, February 1918 had a lot of action. On 1 February while flying his red Albatros D.III Brumowski became involved in an aerial duel with seven or eight Italian fighters. His Albatros was struck by at least 26 bullets, causing gasoline to pour out of his punctured fuel tank. It ignited and set both the upper and lower right wing on fire. Brumowski was able to disengage from the fight and headed for his airfield, where he was able to land the plane without serious personal injury. Three days later he was surrounded by what he described as "eight English fighter aircraft." His Albatros was again shot full of holes, the fabric ripping off his lower wing and the main spar of his lower wing shattering. He was able to break away from his adversaries and set his plane down at the nearby Passerella village airstrip, but upon landing the plane flipped over, resting on its back. Brumowski once again escaped without serious injury. By June 1918 Brumowski had t31 confirmed kills. 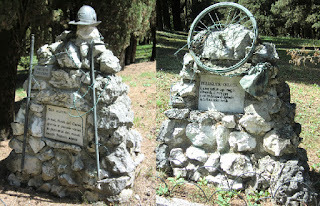 His final four kills would be achieved during the last Austro-Hungarian offensive of the war, the battle of the Piave River, taking place 15–23 June 1918. His first kill of the battle was an Italian observation balloon near Spresiano on 16 June while flying his Albatros D.III (Oef) 153.209. Three days later he scored his last double of the war when he shot down another Italian observation balloon near the village of Passerella, sending it plunging to the ground in a huge fireball. Later that afternoon, he downed an Italian reconnaissance two-seater near Comtee, south of Candelu. The next day he achieved his final kill, number 35. He was flying his Albatros, guarding the last intact bridge over the Piave, when an Italian Ansaldo SAV-5 attempted to bomb the bridge. After a fierce dogfight, Brumowski was able to shoot it down over the Montello. On 23 June 1918 Brumowski enjoyed a relatively uneventful flight in his Albatros D.III (Oef) 153-209. This flight, his 439th against the enemy, was his last combat flight of the war. On 25 June he was ordered to take an extended leave. He did no more wartime flying. 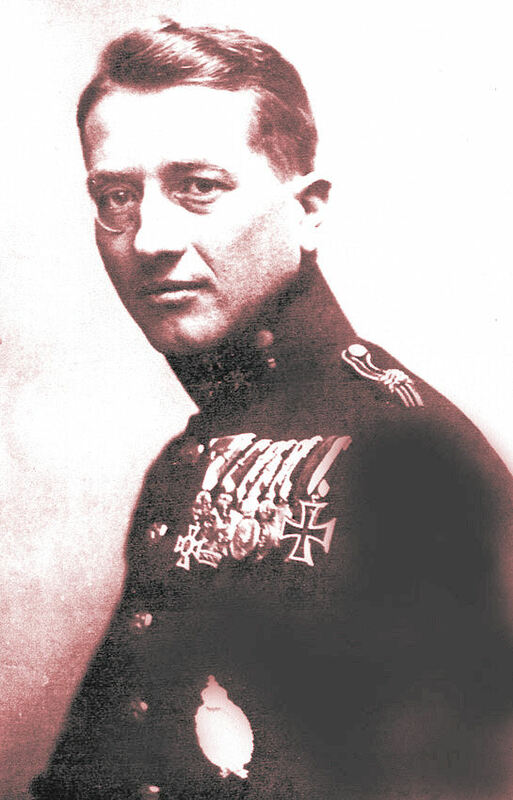 Brumowski received many medals and decorations, almost all of the awards an Austro-Hungarian officer could have, including the Knights Cross of the Order of Leopold with war decorations and swords; the Order of the Iron Crown, third class, with war decorations; the Gold Bravery Medal for officers (one of only nine awarded to LFT officers); but he did not receive the Empire's highest award — the Knight's Cross of the Military Order of Maria Theresa, because he refused to request it, a stipulation of the bylaws of the Order. Generaloberst (colonel-general, roughly a four-star general) Erzherzog (archduke) Josef Ferdinand, the inspector general of the LFT, had written to Brumowski in June 1918, praising Brumowski's many accomplishments and inviting him to apply for the Knight's Cross of the Military Order of Maria Theresa. 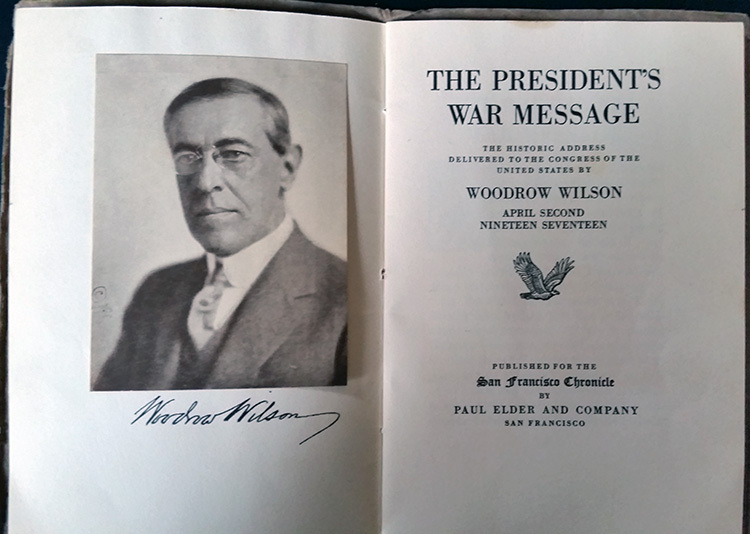 Brumowski replied that "if I have earned this award by my service, then it should be cause enough for the Commander-in-Chief to present it to me. It is not my duty to ask or demand it." He never received the award, which would have made a difference after the war, when the successor states squabbled among themselves about paying pensions to the former KuK officers. The Order paid out a small pension to its members, which helped many former officers, including former Feldmarschall (field marshal or five-star general) Boroević, get by in the postwar years. On 11 October 1918 with less than a month to go before Austria's capitulation in the Armistice of Villa Giusti, Brumowski was appointed to the command of all of the fighter squadrons of the Austrian Army of the Isonzo. Mrs. Ingeborg Sulkowski, Brumowski's daughter from his first marriage recalled that "the defeat of the Empire was very hard for him. He was admired, loved, held in high esteem by his leaders, including the emperor, and suddenly his whole world collapsed around him. There was no more use for a pilot. My mother and father lived in Vienna for a while but then decided to move to Transylvania where the family estate of my widowed grandmother was located. My grandmother [her mother's mother] wanted my father to manage this estate. Here was my father — a military man, not speaking Hungarian, raised in the city with no knowledge of agriculture whatsoever, suddenly in a small town where everybody knew everybody else. It was a disaster. His virtues as a flier were not needed and his failures as a farmer exasperating. His surplus energy combined with his intense love of life drove him to all kinds of activities which people around him could not understand. He hunted restlessly in the mountains. He rode horses often to exhaustion. He raced his automobiles to shambles on the bad roads. He was the first into a burning house and the last out of it. He jumped into rivers during floods to rescue animals. He loved parties and entertained his friends with his very good piano playing. He was an excellent swimmer, ice skater, dancer, etc. There was almost nothing my father could not do if he wanted to, only as the manager of the estate he was a disaster. He finally left, probably because he could not stand it anymore...He remarried in Austria and started a flying school. Here he was in his element." Brumowski returned to Vienna in 1930 and with Hans Low started a flying school in Aspern. On 3 June 1936 Brumowski was teaching an Austrian student how to land at the Schiphol airport near Amsterdam when the plane they were in crashed, fatally injuring Brumowski. He was not quite 47 years old. His body was returned to Vienna, where it lies today, in the Zentralfriedhof (Central Cemetery). 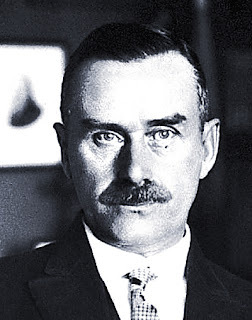 Paul Thomas Mann (1875–1955) was a German novelist, short story writer, social critic, philanthropist, essayist, and the 1929 Nobel Prize in Literature laureate. Mann wrote the essay,“Reflections of a Nonpolitical Man” during the First World War. A riposte to his brother Heinrich’s criticism of Germany and the war, Mann’s essay justified the authoritarianism and inward “culture” of Germany against the moralistic “civilization” and democracy of England and France. Published in 1918, Mann later repudiated the ideas espoused here. I met the New Passion, then, as democracy, as political enlightenment and the humanitarianism of happiness. I understood its efforts to be toward the politicization of everything ethos; its aggressiveness and doctrinary intolerance consisted – I experienced them personally – in its denial and slander of every nonpolitical ethos. “Mankind” as humanitarian internationalism; “reason” and “virtue” as the radical republic; intellect as a thing between a Jacobin club and Freemasonry; art as social literature and maliciously seductive rhetoric in the service of social “desirability”; here we have the New Passion in its purest political form as I saw it close up. I admit that this is a special, extremely romanticized form of it. But my destiny was to experience it in this way; and then, as I have already said, it is always at any moment on the verge of assuming this form: “active intellect,” that is: an intellect that is “resolved” to be active in favor of enlightened world liberation, world improvement, world happiness, does not long remain “politics” in the more abstract, figurative sense; it is immediately so in the strict, real sense as well. And – to ask the question again foolishly – what kind of politics is this? It is a politics that is hostile to Germany. This is obvious. The political spirit that is anti-German as intellect is with logical necessity anti-German as politics. When, in the following pages, I have held that democracy, that politics itself, is foreign and poisonous to the German character; when I have doubted or argued against Germany’s calling to politics, I have not done so – personally or impersonally – with the laughable purpose of spoiling my nation’s will to reality, of shaking its belief in the justice of its international claims. I myself confess that I am deeply convinced that the German people will never be able to love political democracy simply because they cannot love politics itself, and that the much decried “authoritarian state” is and remains the one that is proper and becoming to the German people, and the one they basically want. A certain amount of courage is required today to express this conviction. Nevertheless, in doing so, I not only intend no derogation of the German nation in the intellectual or in the moral sense – I mean just the opposite – I also believe that its will to power and worldly greatness (which is less a will than a fate and a world necessity) remains completely uncontested in its legitimacy and its prospects. There are highly “political” nations – nations that are never free of political stimulation and excitement, that still, because of a complete lack of ability in authority and governance, have never accomplished anything on earth and never will. The Poles and the Irish, for example. On the other hand, history has nothing but praise for the organizing and administrative powers of the completely nonpolitical German Nation. When one sees where France has been brought by her politicians, it seems to me one has the proof in hand that at times things do not work at all with “politics”; and this is turn is a sort of proof that things can also work in the end without “politics.” Therefore no misunderstanding should arise when people like me declare the political spirit to be an alien and impossible spirit in German. What provoked the deepest element in me, my national instinct, was the cry for “politics” in that meaning of the word that belongs to the intellectual sphere: it is the “politicization of the intellect,” the distortion of the concept of intellect into that of reforming enlightenment, of revolutionary humanitarianism, that works like poison and orpiment [arsenic] on me; and I know that my disgust and protest is not something insignificantly personal and temporary, but that here the national character itself is speaking through me. Intellect is not politics. As a German, one does not have to be bad nineteenth century to fight to the death for this “not.” The difference between intellect and politics includes that of culture and civilization, of soul and society, of freedom and voting rights, of art and literature; and German tradition is culture, soul, freedom, art, and not civilization, society, voting rights, and literature. The difference between intellect and politics, as a further example, is the difference between cosmopolitan and international. The former concept comes from the cultural sphere and is German; the latter comes from the sphere of civilization and democracy and is – something quite different. The democratic bourgeois is international, even though he may drape himself everywhere ever so nationally; the burgher, also a motif of this book – is cosmopolitan because he is German, more German than princes and “nation”: this man of the geographical, social, and spiritual “middle” has always been and remains the bearer of German intellectuality, humanity, and antipolitics. Source: Thomas Mann, "Reflections of a Nonpolitical Man" (1918) found at http://germanhistorydocs.ghi-dc.org/. One the tireless workers for peace during the Great War was Pope Benedict XV, who was elected to office a month after the beginning of hostilities. 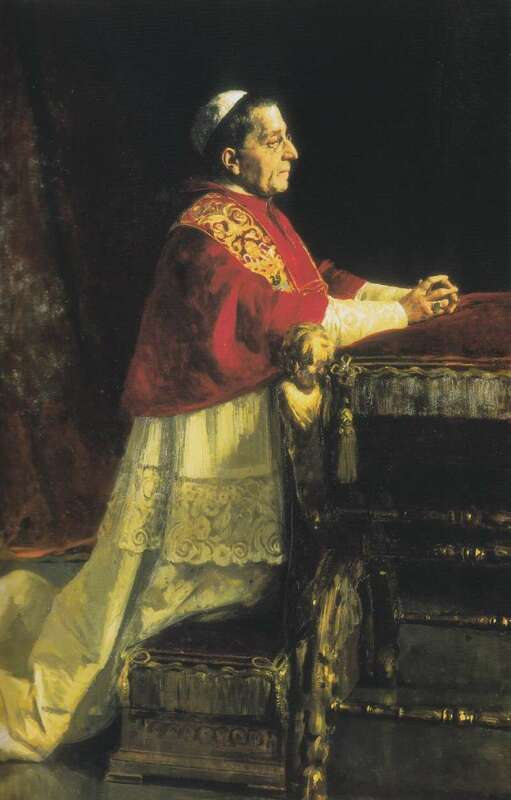 Benedict was concerned with the conflict especially as it configured Catholic countries such as Austria against Catholic countries such as Italy—enough so that on 1 November 1914 he issued his first encyclical on the war, "Ad Beatissimi." It simply called for both sides to cease fighting, a simplicity disparaged by this comment in one Allied paper: "It is really difficult to believe that this was actually written in the year 1914; it sounds like the utterance of an elderly gentlewoman of about the year 1830." Investigations into the sinking of Leonardo da Vinci and some suspicious earlier cases of sabotage led to Monsignor Rudolf Gerlach, Benedict's Keeper of the Robes and a native Barvarian. Despite disclaimers by him and by Benedict, his espionage and fund raising efforts for Imperial Germany were uncovered during the investigation into the battleship incident; he was turned over to Italian authorities and they in turn expelled him across the border into Switzerland. Papal commentor Frank J. Coppa wrote of the impact of this espionage scandal: "Although a court of inquiry exonerated the Vatican in any complicity in the Monsignor's schemes and spying, the "Gerlach Affair" rocked the Vatican, sent Pope Benedict into a spiral of depression, and seriously compromised the papal image of strict impartiality." Red Cross War Cake Ready to Send "Over There"
World War I was the great watershed of this era, the “war to end all wars” that began with the assassination of Austria’s Archduke Ferdinand and Duchess Sophie in Serbia in 1914. By the time the U.S. servicemen (Doughboys) arrived at the Western Front in the summer of 1917, America had been supplying our British, French, and Belgian allies with food for two years. The U.S. troops were well provisioned, startlingly so compared to their ally comrades. That old military standby, hardtack, was replaced by fresh bread whenever possible, thanks to the development of field bakeries that could provide hot food at the front. Small, wagon-sized food carts, sent from the field kitchens located behind the front lines, even brought hot food into the trenches, where most of the fighting and casualties took place. 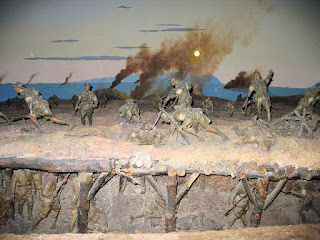 Infested with rats and other vermin, subject to poison gas attacks and shelling, and filled with cold, greasy mud, the trenches presented a uniquely harrowing experience to the Doughboys, many of them fresh off the farm in America. The arrival of cooked food, along with candy, dairy products, and soft baked bread struck a much appreciated but incongruous note in the hell known as trench warfare. Of course, there remained the challenge of keeping the food dry, clean, and away from the rats. Naturally, one big problem for feeding the troops on the front was the safety of the supply lines, which were targets for bombs and other sabotage. Every soldier in the trenches carried emergency rations containing 12 of canned meat or fresh bacon, ground coffee, sugar, and tobacco with rolling papers (and later, pre-rolled cigarettes). The Army purchased canned meat from the French, which was labeled “Madagascar” and promptly nicknamed “monkey meat” by the Americans in disgust. In this environment, hardtack still made its appearance on the Doughboy menu. These “Reserve Rations” were designed to sustain the troops when the supply lines broke down, or when they were too far from the supply depots. The servicemen’s rations defined part of the wartime experience for a generation of men that remained with them long after they shipped home. 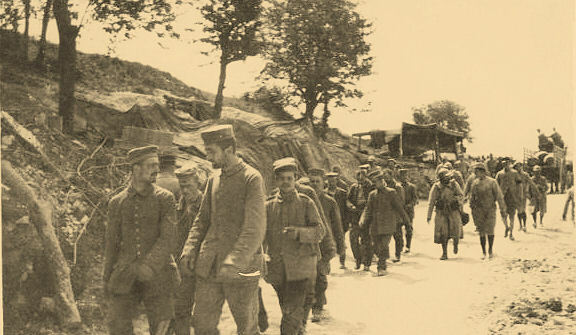 In France, the soldiers were billeted in relative safety before and after their service in the trenches. Here they had dependable access to food and might even receive packages from home. Of course, food shipped from the United States had to remain edible without any extra care. Even when stale and crumbled, any food sent by loved ones was always particularly appreciated. The American Red Cross, founded by Clara Barton in 1881, played a significant role in this multinational conflict. It not only provided medical care overseas, before there was an enlisted military nursing staff, it also helped on the home front by organizing volunteers and fighting the deadly Spanish Influenza plague of 1918 that, worldwide, would kill more people than the war did. 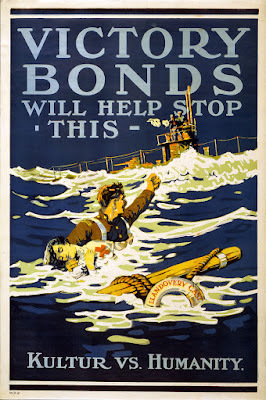 The Red Cross also communicated with families about helpful ways to support the troops. Here is a recipe they recommended for folks who wanted to send their soldier a shippable treat. Put all ingredients except the flour and the soda in a large pot. Bring to a boil over medium heat, stirring frequently. Bring to a boil, then reduce the heat to a medium low and let it cook at a low boil for 5 minutes. Remove from heat and cool. Stir in flour and soda. Mix well. Grease a bundt pan. Pour batter into the pan and bake for 45 minutes. Pour the ½ cup mixture of 50-50 dark rum and orange juice over it twice. The American Red Cross promoted this cake recipe, promising that the end product could reach the Western Front and retain its freshness. The dried fruit helps keep it moist if it has to be shipped across the Atlantic. 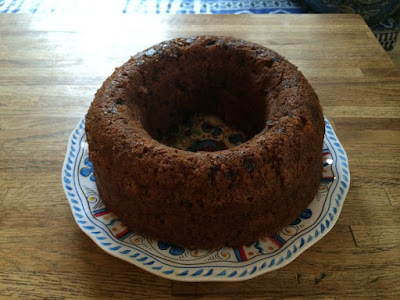 Try soaking the raisins in rum for a few days or for a week before you make the cake. Your Doughboy will thank you. The original recipe comes with a recommendation: “Cake keeps fresh for a long time and can be sent to men at the front.” Our contributor Libby O'Connell is a member of the U.S. World War One Centennial Commission and the Chief Historian of the History Channel. This recipe is "Bite 66" from her historical cookbook, The American Plate: A Culinary History in 100 Bites. Gordon Martel’s opening statement that "This is not another book on the 'origins' of the First World War" is apt and accurate. It was this claim that first encouraged me to read his book, and I wasn’t disappointed. Its 400 pages passed quickly; I only slowed down at times when I referred to one of the endnotes, studied one of the portraits, or looked back to the four pages listing the principal characters. Martel’s prose flows clearly and easily, and it’s not hard to see how he is presenting his story (as he warns us) in the tone of a detective story rather than a history. 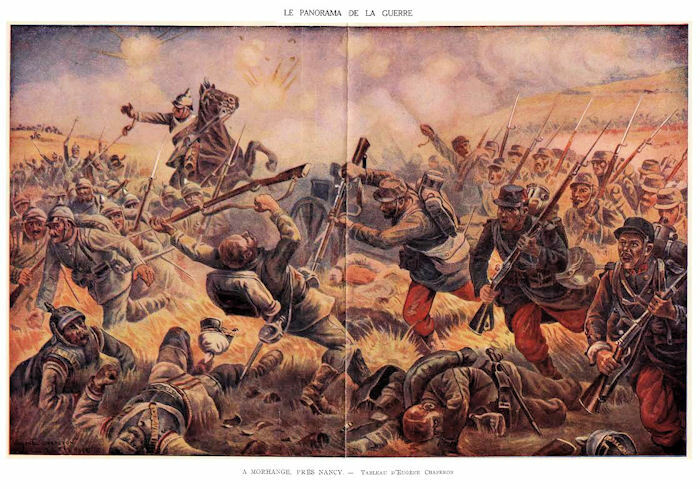 An almost 50-page Prologue, “The Long European Peace,” provides background for Martel’s story and prepares us for the “crime scene.” Two dominant and conflicting threads prevail: (1) the certainty in most people’s minds that war was a thing of the past, and (2) the ongoing scurrying of diplomats and military leaders to make secret alliances and war plans. Then the main characters are presented: Wilhelm II, Franz Joseph I, Nicholas II, Raymond Poincaré, and Sir Edward Grey. Their backgrounds, viewpoints, strengths, and weaknesses, not to mention very human foibles, make for fascinating reading. Prime figures that they are, however, they’re not the main perpetrators. These appear in the following chapters. After the Prologue the book is divided into four parts. The first two chapters in Part One, “The Killing” and “The Reaction,” describe events that we may already be familiar with. However, Martel presents these details in a refreshing and almost exciting manner, and I found myself eager to find out what was going to happen next. More actors appear on the scene, ones we have met before plus some less familiar ones. Gavrilo Princip is central to events now, but is surrounded by a host of fellow conspirators and supporters. Their backgrounds and motivations are fully described (even if their names are unpronounceable) and we’re given details of their actions and the resulting climactic event. Then follows much diplomatic debating, indecision, and subversion by another set of leading characters we come to know well —Austrian, German, French, Russian, British, and others. But this is still a gathering of facts for the detective narrator, who after all is on the trail of the main crime — the Great War. The “rumors, speculations, discussions, half-truths and hypothetical scenarios” (p. 156) greatly muddy the wandering trail leading up to the delivery of Austria’s ultimatum to Serbia at 6 p.m. on Thursday 23 July. But the next eight days, 24–31 July, tend to concentrate matters, and Martel fine-tunes Part Two of his book into eight chapters, one for each of these days. We see the full text of Austria’s ultimatum and also the Serbian reply, but swirling around these key documents for over a week are a host of hourly intrigues, demonstrations, hopes, denials, lies, misinformation, wavering—a veritable catalog of vacillations. Attempts to localize the quarrel—to limit it to Austria and Serbia—make little headway, and the threat of European mobilization becomes real. We may already be aware of some of the events covered in these chapters, but the author relates them with splendid clarity and without judgment—we are still gathering the facts, just the facts, leading up to a terrible crime that might be prevented at any point during these eight days. We then move to Part Three: “Days of Decision,” where the events of 1–4 August are given even higher resolution. Forty pages describe how peace now hangs in the balance. The suspense is palpable, particularly since Martel clearly shows what an agonizingly fine line now divides war and peace—in spite of being “extraordinary close to war,” the involved nations “were also extraordinarily close to peace” (p.361). 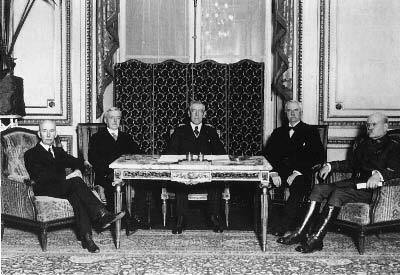 Belgian neutrality is discussed, cabinets deliberate, ambassadors suggest, ministers propose, and armies prepare. The desperate hope is voiced that nations might allow their fully mobilized armies to simply face each other without attacking. Public anti-war sentiment gradually begins to dissipate while religious sentiment increases—especially in Russia—with prayers not only for peace but also for victory. On the last day, 4 August, Sir Edward Grey, meeting with the American ambassador at 3 p.m. sadly confesses that “the efforts of a lifetime” had now come to nothing: “I feel like a man who has wasted his life” (p. 394). The final section of the book, Part Four: "The Aftermath," is subtitled “Making Sense of the Madness” and is perhaps the author’s most powerful chapter. He doesn’t analyze the causes of the war or try to assign blame. Instead he gives an excellent account of how the war was rationalized by the involved countries—both immediately after its outbreak and in the decades following its conclusion. From the start every government claimed to have acted purely in self-defense, and as Martel points out, “The explanations and excuses, justifications and recriminations that began to flow in the first days of August would soon turn into a flood” (p. 402). This flood continues even today. Mountains of documents, millions of pages, have been analyzed and hundreds of books written on what caused the war, who was responsible, and what lessons were learned. Martel gives an excellent survey of this literature and of the key figures who were to “play the blame game” over the years. Finally he reviews events that spawned the Second World War, and paraphrasing A.J.P. Taylor observes that “Men do learn from their mistakes: they learn how to make new ones” (p. 422). Roger Casement (1864–1916) was born at Doyle’s Cottage, Lawson Terrace, Sandycove, Co. Dublin, the son of Captain Roger Casement of the 3rd Dragoon Guards of the British Army and Anne Jephson from Mallow, Co. Cork. His mother had him secretly baptized in her own religion, Roman Catholic, but he was raised in the Protestant faith of his father. As both his parents died young, Roger was taken in by his uncle, John Casement of Magherintemple, near Ballycastle, Co. Antrim, and educated as a boarder at the diocesan school in Ballymena. After leaving school in 1880, Casement worked in various employments, including clerking, administration, and civil service work in Africa. From 1895 onward he held consular appointments at various locations in Africa, including Boma in the Congo, where the British Foreign Office authorized him to investigate and report on Belgian mismanagement. 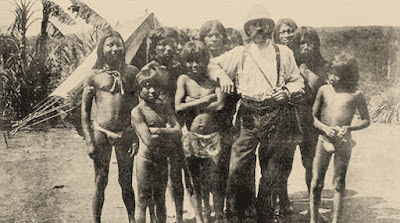 His report condemned the Belgian administration as ruthless, and it exposed systematic infringement of the human rights of the indigenous people. The report earned Casement a CMG (Order of St Michael and St George) in 1905. He resumed consular service with postings at Santos, Paraguay, and Rio de Janeiro in Brazil. He was then commissioned to undertake a report on the reported abuse of workers in the rubber industry in the Putumayo basin in Peru. The report was published as a parliamentary paper (1911) and had considerable impact, gaining Casement international recognition as a humanitarian, his contribution being acknowledged with a knighthood. Meanwhile Casement had been a member of the Gaelic League for some years and participated in its cultural activities whenever he was in Ireland. He was learning Irish and had an active interest in Irish literature, history, and tradition. It would also appear that by the time he left the consular service around 1911 he had become disillusioned with the British Empire and what he had come to regard as its unjust dominion over Ireland. Moreover, he became increasingly radicalised by the opposition of the Ulster unionists to Home Rule from 1912 onward. On the founding of the Irish Volunteers in November 1913, he became a member of the provisional committee. When the war broke out in August 1914 he was in the United States raising funds for the Irish Volunteers. In the new political scenario, he identified Germany as a potential Irish ally and he determined to seek German assistance. Casement was regarded with scepticism by many Irish nationalists who either suspected his integrity or considered him volatile and dangerous. Nevertheless, the Clan na Gael leader John Devoy, who hosted his American tour, put him in contact with the German ambassador, who arranged for him to visit Berlin. Casement had three demands: arms, German officers to lead an insurrection in Ireland, and the formation of an Irish brigade consisting of Irish soldiers in the British Army then held as prisoners of war in Germany. The Germans promised only a relatively small quantity of arms, and few of the prisoners of war were willing to join the Irish brigade. On learning that an insurrection was planned for Easter, Casement determined to stop it, as he believed it was doomed to failure without substantial arms and German support. they did not constitute treason. Casement was arrested at Banna Strand in Co. Kerry on Good Friday 1916, having been put ashore by a German submarine. Meanwhile, the ship transporting the German rifles, the Aud, was intercepted by the Royal Navy off the south coast and scuttled by her captain. 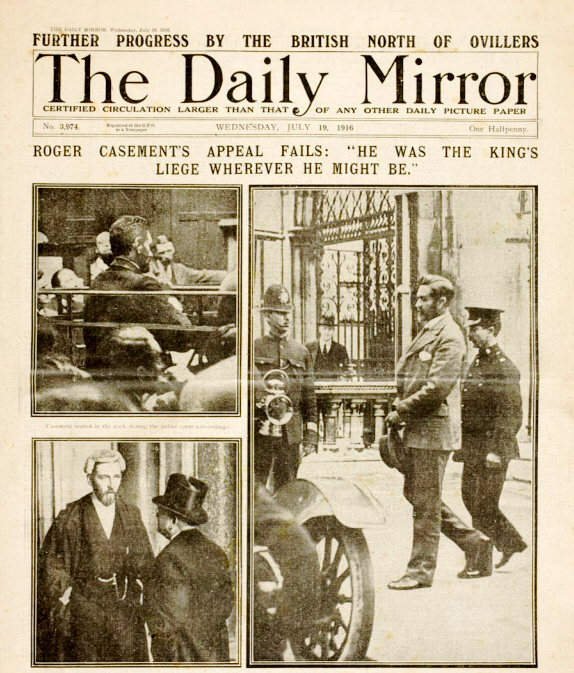 Casement was taken to the Tower of London and tried for high treason at the Old Bailey. In the meantime, British officials privately circulated diaries, seemingly in his hand, which detailed homosexual activity, the intention presumably being to discredit him and so ensure that he did not achieve the status of a martyr for the Irish cause. He was found guilty of treason. Before his execution he was received into the Roman Catholic Church. Roger Casement was hanged at Pentonville Prison on 3 August 1916. He was unmarried. 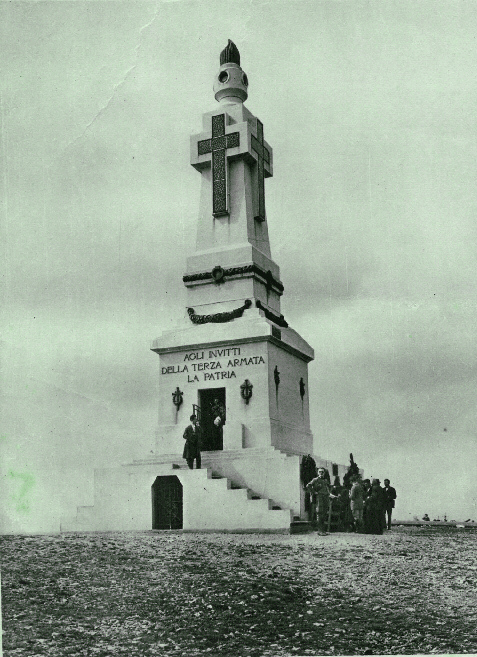 In earlier postings we have discussed what is one of the most overpowering war memorial in the world, the Italian Third Army Memorial at Redipuglia, Italy. 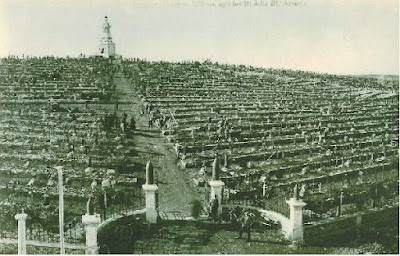 (More details) The burial site of 100,000 fallen of the Third Army's battles on the Carso Plateau is shown below, viewed from the less imposing but equally remarkable nearby Remembrance Park of Colle Sant' Elia. The current park, however, is the product of an evolution. In 1919 it was decided to convert the little knob at the base of the plateau from a wartime field cemetery to the final resting place for 30,000 of the fallen from the nearby battles. Here is the completed cemetery, which featured a memorial chapel at the crest. 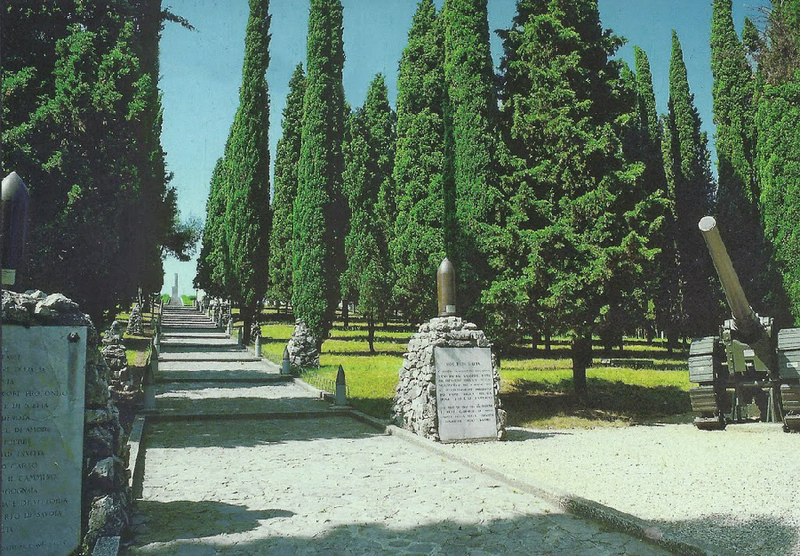 By the mid-1930s this was deemed inadequately grand by the Mussolini regime, and the larger formal memorial was built across the street on the edge of the Carso, where the very first Battle of the Isonzo was launched in 1915. Colle Sant' Elia was converted to the park and outdoor museum at that time. The entrance shown below was photographed from about the same position as the photo above. 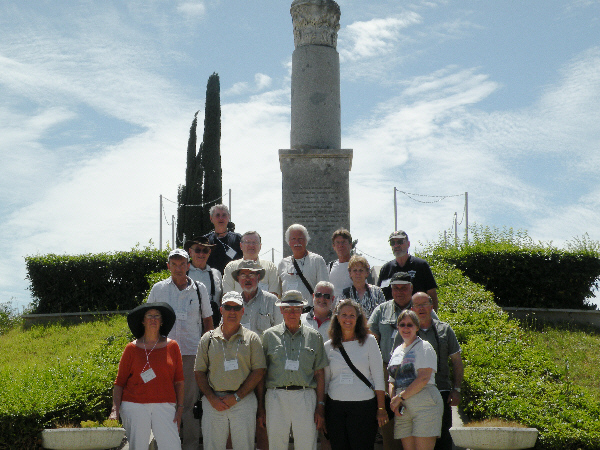 On a more human-sized scale, the Remembrance Park – I saw with my 2011 tour group – leaves visitors with much more of an impression than the huge formal memorial. The site incorporates weaponry, equipment, and a dugout complex, but the feature that people enjoyed most were the uniformly constructed tributes to the branches of the Italian Army the mark the main pathway to the top of the hill. Above is visible the marker for the Artillery Corps. Here are the tributes to the Alipini mountain troops, and the cyclist troops of the elite Bersaglieri, light infantry. The original Third Army Memorial Chapel was dismantled in 1938 and replaced at the new monument. At the chapel site today is a simple Roman column dedicated to the fallen of all wars. The first official designation of the wearing of shoulder sleeve insignia came in a memorandum dated 15 October 1918, from GHQ AEF that “some distinctive cloth design which will be worn by every officer and man on the left arm.” It should be noted that while divisional insignia was approved during the war, it generally wasn't worn by the troops during the fighting, but became nearly universal during the post-Armistice period, while some of the men were on occupation duty and others were being kept busy awaiting transportation home. The first U.S. Army patches were produced by sewing or gluing pieces of cloth together. Most of these early patches were made from material the soldiers either had at hand or could obtain easily, such as the brown wool from their U.S. Army blankets, shirts, or puttees (their wrap-around leggings). Most of the colored cloth came from discarded or captured French and German uniforms. The first official "shoulder patch" as it is worn today was officially introduced into the U.S. Army in October 1918 by soldiers of the 81st Division who wore a hand-embroidered "wild cat" badge on their upper left arm. This reflected the fact that Wildcat Creek ran through Camp Jackson, South Carolina, where the division had been organized on 25 August 1917. 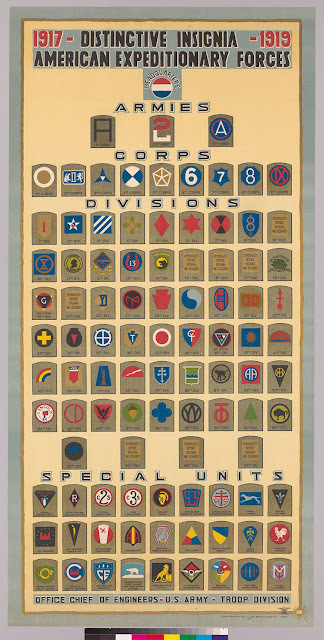 The division adopted the name of the "Stonewall" Division after General Thomas "Stonewall" Jackson of War Between the States fame. It was further agreed that since the majority of its personnel had come from all the Southern states surrounding South Carolina and were mostly from the mountains and other agricultural and sparsely settled communities, that the wildcat (which was common in the Carolinas) was adopted as the insignia of the division. Tethered balloons allowed World War I observers to see as far as 40 miles behind enemy lines to spot troop movements, chart trench systems, and direct artillery fire. 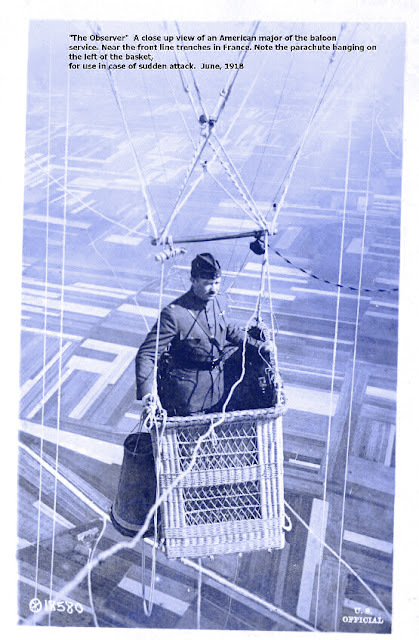 The observation balloon most used by Americans was named for its designer, French engineer Lt. Albert Caquot. The hydrogen-filled balloon could lift two passengers in its basket, along with charting and communications equipment, plus the weight of its mooring cable, to a height of about 4,000 feet in good weather. Normal operations were between 1,000 and 4,000 feet. 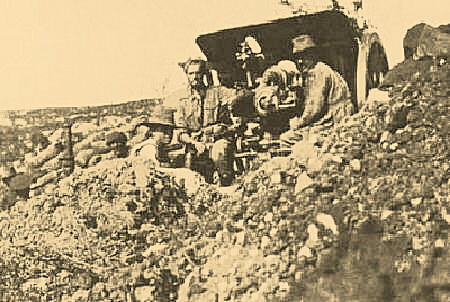 During WWI, American balloon observers directed artillery fire at targets such as troop concentrations and supply dumps. They noted more than 1,000 enemy airplane sightings, 1,000 instances of military traffic on railroads, and roads and 400 artillery batteries. 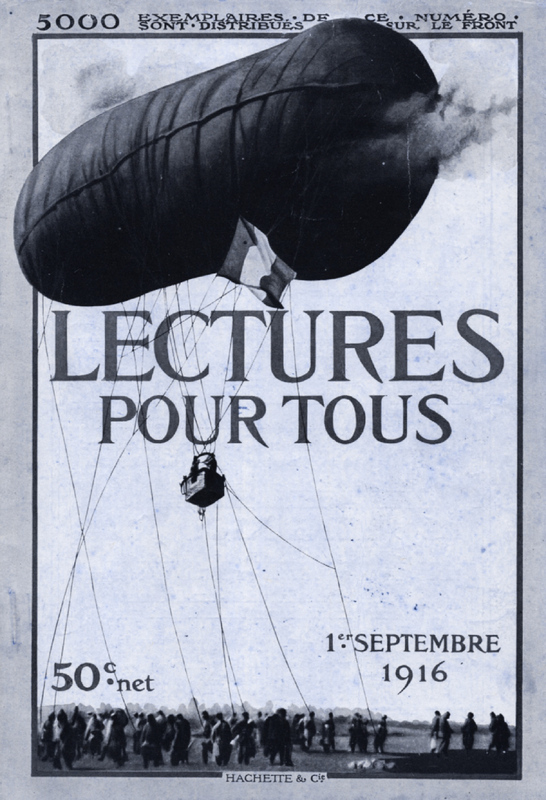 Caquot balloons were manufactured in great numbers in WWI; nearly 1,000 were made in the United States in 1918–1919. During World War II, the British produced Caquots once again, but in limited numbers. Manufactured in 1944, the balloon displayed at the USAF National Museum is believed to be the only survivor. The British used it for parachute testing and noncombat aerial observation and photography until 1960. 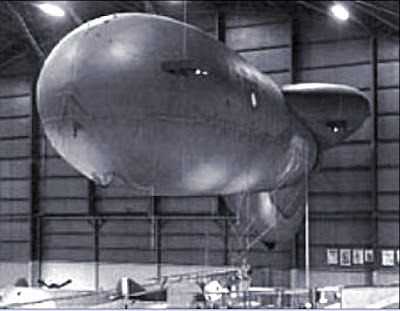 The British Ministry of Defense, Royal Aircraft Establishment, presented the Caquot to the museum after it was located with the aid of American and British WWI balloon veterans in 1975. Assisted by the Goodyear Aerospace Corp. of Akron, Ohio, which had produced these balloons during WWI, museum personnel mended and sealed the balloon fabric and prepared it for inflation. 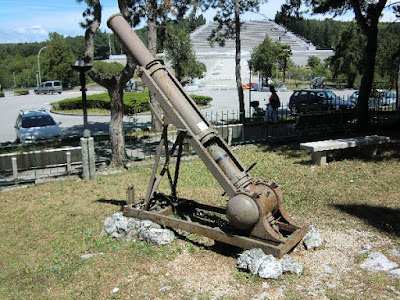 It was placed on display in May 1979. The Maryhill Stonehenge is a replica of Stonehenge located in Maryhill, Washington, overlooking the Columbia River. 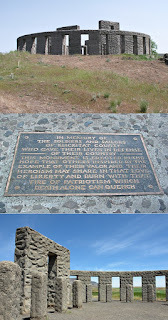 It was commissioned in the early 20th century by businessman Samuel Hill and was dedicated on 4 July 1918 as a memorial to the citizens of Klickitat County,who would die in World War I. The memorial was completed in 1929. It is constructed of concrete. Because of its pre-Armistice dedication it is considered America's first memorial to the fallen of the war. 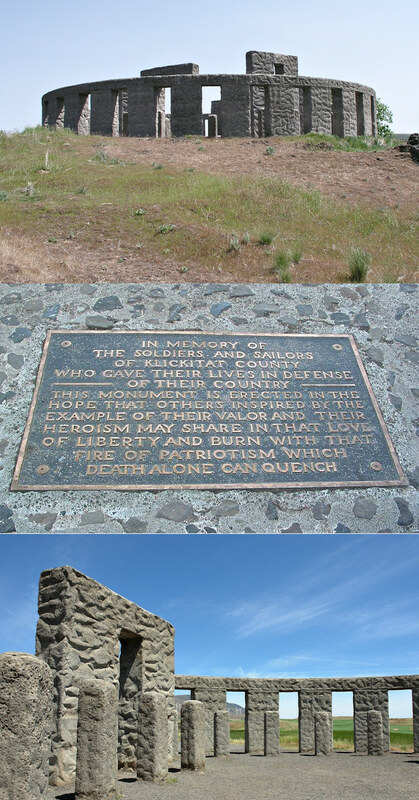 Six names of Klickitat County soldiers were included at the monument immediately upon its dedication and seven more were added before the Armistice. After a 1995 restoration of the site, Maryhill Museum Director Josie De Falla said that the memorial "assists in communicating what Sam Hill, a Quaker, felt so fervently: that it was imperative that future generations never lose sight of the loss of life, as well as the heroism and valor, which result from war"
Sam Hill had visited Stonehenge on England's Salisbury Plain with Lord Horatio Herbert Kitchener (1850–1916) in 1915. Kitchener was Britain's Secretary of State for War at the time and it was supposedly he who told Sam Hill, "Here the ancients 4,000 years ago offered bloody sacrifices to their heathen gods of war" (Tuhy, p. 190). At the time it was generally thought that Druids had constructed Stonehenge as a place for human sacrifice. This idea has since fallen out of favor (some archaeologists believe Stonehenge functioned as an astronomical calendar), but it had a powerful impact on Hill at the time. A Quaker and lifelong pacifist, Hill reasoned that modern warfare (like Druid sacrifices as he understood them) was a form of needless human sacrifice. Hill's biographer John Tuhy quotes Hill as later saying that he built the Maryhill Stonehenge "to remind my fellow man of [that] incredible folly" (p. 190). Hill asked Professor W. Wallace Campbell (1862–1938) of the Lick Observatory, who was in Goldendale to observe a total eclipse of the sun visible there on June 8, 1918, to decide where the altar stone should be positioned. The stone's placement and the plan for where the standing pillars would later be located were based on Campbell's calculations of where sunrise would be on the summer solstice. What Was Monty Doing in the Great War?